Canadian gold giant Goldcorp (TSX:G), (NYSE:GG) said Wednesday it had to suspend operations at its Los Filos mine in Mexico as it was unable to negotiate the renewal of an occupancy agreement with the Carrizalillo Ejido, a local landowners group. The Vancouver-based company, at $22.5 billion the world's second most valuable gold miner after Barrick Gold (TSX:ABX), said certain activities related to environmental safeguards and site security will continue during the suspension. According to MiningWatch Canada, the mine did not stop on the company’s volition. "Rather, after talks broke down Monday night, the Ejido Carrizalillo announced an indefinite strike outside the mine starting early Tuesday until the company seriously addresses their concerns," the watchdog said in a statement. In the flurry of news that has been coming out of the Mexican press, representatives of the landowners group have emphasized concerns about the long term environmental and health costs of Goldcorp’s highly profitable open-pit gold and silver operation located a mere kilometer from their community. “After the mine, there will be nothing left,” Julio Peña Celso, a member of the Oversight Committee of the Ejido’s Commission, told local newspaper to Milenio.com (in Spanish). Los Filos mine directly employs about 2,600 people from the surrounding communities with an estimated 10,000 additional jobs created as a result of the mine's presence in the region. 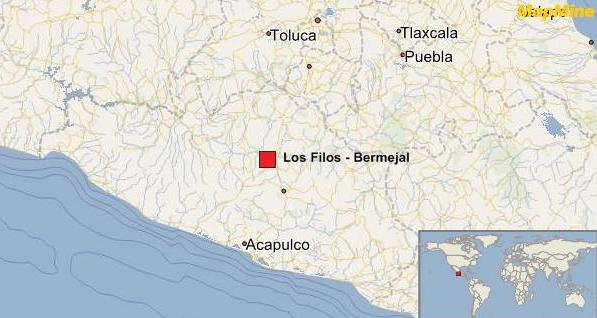 The operation comprises two open-pit mines – Los Filos and El Bermejal – and one underground mine. The open-pit operation began commercial production in January 2008. The news come on the same day the company has learned that it is now competing with Yamana Gold (TSX:YRI) over the potential takeover of Quebec-based Osisko Mining (TSX::OSK).